In our household we use this basic curry recipe all the time. Then depending on what ‘s in the fridge I might make it with chicken or make a vegetarian version with chickpea & vegetables but my latest variation is using paneer and spinach. It works really well! 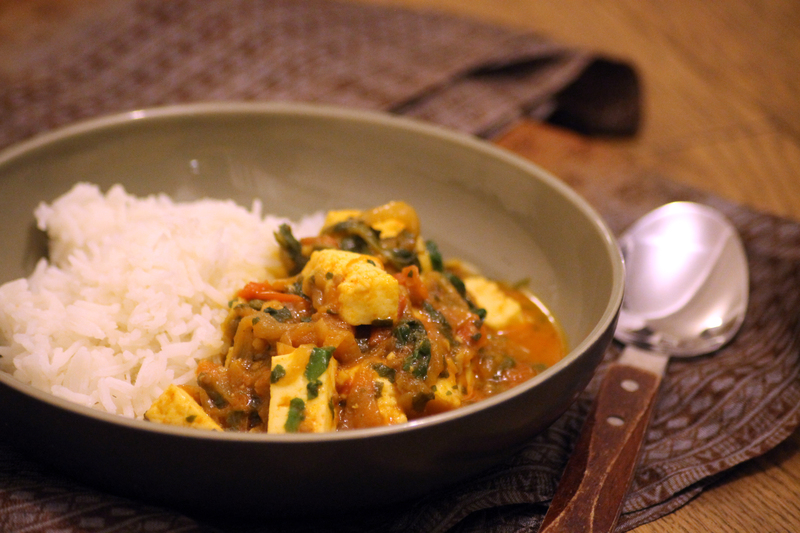 Paneer is a mild Indian cheese that is easy to digest, high in calcium and contains no salt. It is therefore ideal for babies. 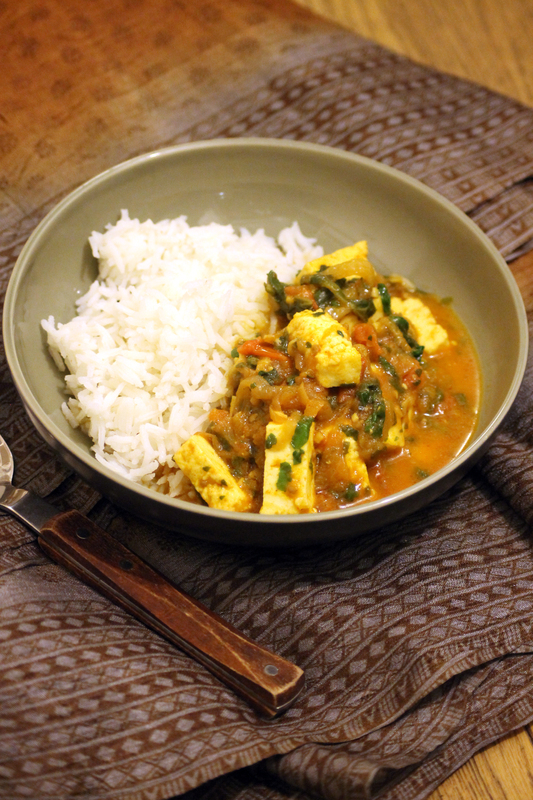 The base for this curry recipe is taken from ‘ 50 great curries of india’ by Camellia Panjabi. It a really simple way of making a curry from scratch and it’s really mild. It actually has no chilli whatsoever but the use of fresh ginger & garlic with ground spices creates a curry that is still packed with flavour. The trick is to cook the onions for a long time on a low heat until they are brown. It is a little time consuming but it’s worth the extra effort! 225g Paneer, chopped in rectangles. Heat the oil in a pan on medium heat. Add the onions, then sauté over a low heat until the onions become deep brown. This can take up to 25 minutes. Add the fresh chopped garlic and ginger and fry for 1 minute. Then stir in the coriander powder and fry for another minute. Add the remaining spices then pour in 200ml of water and chopped tomatoes. Cook for approximately 15 minutes. This is the base for the curry sauce. You could then add meat or vegetables of choice. Add the paneer & spinach and cook until warmed through. Correct the consistency with a little water if required. Season the adult portions with a little salt to taste.